Stay tuned for upcoming events for Parasailing in near future. Parasailing is a secure and trendy water sport in which parasailer is tied to a parachute-like covering known as a Parasail and rises in the air. 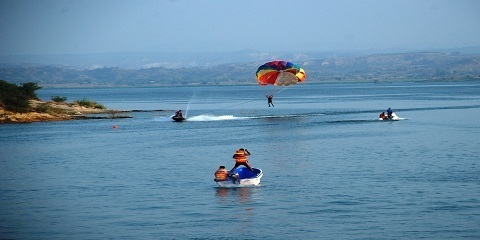 The Parasail is connected to a towrope which is then drawn by a boat. When the speed of the Parasail crosses a certain speed, the Parasail hoists lifting the pilot up into the air. We make sure parasailing at it’s best. Check out the waters with us from way up high with an exceptional system that provides an easy and safe ride as you are hoisted from a platform on the back of the boat. Best Viewed at 1024 x 768 pixels and above. This Page loaded in 0.09174 seconds on Tue, Apr 23, 2019 (13:38).